The group heard about a range of activity from member agencies to support ACE awareness/Trauma informed practice. CYPSP, for its part, continues through Locality Groups and Family Support Hubs to support activities around the Resilience documentary. The Five Nation ACE Special Interest Group met in Dublin on 28th and 29th November. The meeting was hosted by TUSLA. On the evening of 28th November an event was hosted by the Irish Prison Service in the women’s prison. The Irish Prison Service are very committed to trauma informed practice and the event represented an important opportunity to hear about their work with a very vulnerable population. The full meeting of the group looked at developments across the five nations in promoting ACE awareness /trauma informed practice. A common agenda has emerged across the different countries around ACEs. 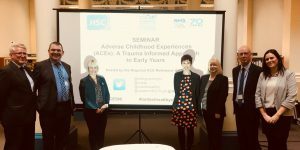 The event enabled the Regional ACE Reference Group to highlight the opportunities to develop a consistent trauma informed network across Northern Ireland through a number of initiatives including the Cross Border CAWT Multiple Adverse Experiences (MACE) Project and the EITP Trauma Informed Practice Workforce Development Project. The Northern Ireland Regional ACE Reference Group will host a seminar on Adverse Childhood Experiences as a side event for the WHO International Healthy Cities Conference to be held in Belfast from 1-4th October 2018. This event will explore policy and early intervention implementation implications (as well as actions to date) for Northern Ireland and Scotland to date linked to the increasing body of international research identifying the long-term harms that can result from chronic stress during childhood. Children who are routinely exposed to situations such as domestic violence, mental ill health, alcohol and other substance misuse problems in their homes experience a negative impact which can last well into adulthood. These chronic stress situations are called Adverse Childhood Experiences (ACEs) and are often associated with poorer outcomes for children in educational attainment, employment, involvement in crime, family breakdown, and a range of health and wellbeing measures. This event is aimed at those who are interested in the policy and practice implications for developing an ACE aware society. The Southern Health and Social Care Trust invite you to a unique event to experience the impact and benefits of trauma informed yoga in practice with our service users. This event is co-produced with the young people who took part in the Award Winning Yoga Programme in Southern H&SC Trust. The impact of yoga on children and young people’s physical and mental well being. Transfer of the programme for use in different settings. For anyone working with children and young people. For those interested in implementing the programme with other service users. Over 100 representatives from the community, voluntary and statutory sector including Departmental staff attending the recent Partnerships Conference to explore how the South Eastern area are responding to adverse Childhood Experiences. 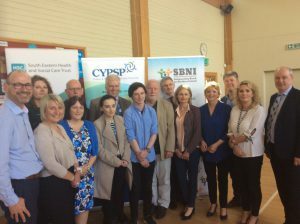 CYPSP Chair Hugh McCaughey (CEO, SEHSCT) spoke from the event and said “we can no longer work in silos, we get better results when we work together”. Part 1: What are ACEs? Part 3: What are we doing about ACEs?